Applied Ecology, Inc. provided GIS database management, data conversion and integration into GIS, quality assurance, and database tool development of survey data of all above ground infrastructure for the Cape Canaveral Airforce Station (CCAFS). The project took place in two phases, the start-up and initial workflow validation phase and the subsequent data collection phase. Applied Ecology dedicated significant effort upfront to plan the field data acquisition, create map books, develop the appropriate custom tools to more efficiently process datasets, and conduct a pilot test of the workflow and toolsets to validate and perform any necessary corrections to the data collection and processing workflow. 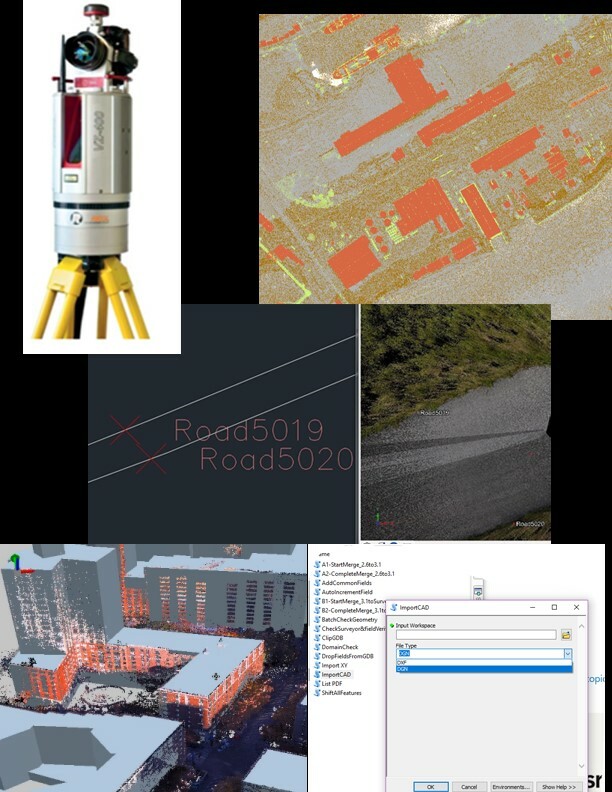 Most of the survey data was collected by the survey team using a Riegl VZ-400 3D laser scanner. This data was provided to Applied Ecology in AutoCAD format. A small amount of data was collected by more traditional survey methods and provided in CSV format files. We created script tools to batch import CAD files and CSV files into a temporary geodatabase. The feature data in the temporary geodatabase was then combined with the existing feature data using a series of custom script tools that we developed in-house. The use of custom GIS tools greatly increased efficiency in data processing and integration, reducing the project timeline and cost significantly. CCAFS Data Collection and Importation. Applied Ecology understands the complexity of managing large datasets and incoming data from multiple groups. To minimize manual validation of extensive datasets, particularly under severe time constraints, we created script tools to replace existing features in the database with the new surveyed location. Attribute information was retained from previously existing features and applied to the newly surveyed feature locations. Creating such tools greatly improved accuracy and repeatability while reducing labor needs.